Case1: When ray of light travels from rarer medium like air to a denser medium like glass then it bends towards normal. 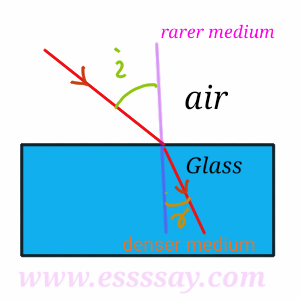 Case 2: When ray of light travels from denser medium like glass to a rarer medium like air then it bends away from the normal. 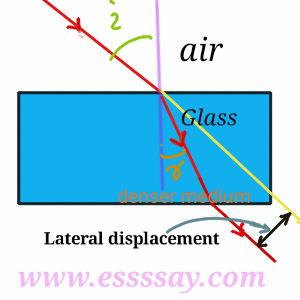 Case 3: When ray of light travels from rarer medium like air to a denser medium like glass and again emerges to the previous rarer medium then it suffers a lateral displacement as shown in the figure.